Home/How to Design and Set Up a Poultry Farm? If you’re thinking of starting a chicken farm business you’re going to need good quality equipment to get started. Of course you will also need chickens, as well as fresh water and the right food to feed them, and at least some basic knowledge of how to rear them either for egg production or for chicken meat. A chicken farm can be a highly profitable business, not least because it is one of the few meat products that are not outlawed by any country or religion. On a smaller scale it can provide any family with a sustainable source of food. The design and construction of any chicken farm depends on its potential size, location, and any zoning or other regulations laid down by the local authority. Some of the issues that need to be addressed include noise and smell, and there may be specific requirements in your area that you need to adhere to. Of course the way the chicken farm is set out will also depend on budget, and the number of chickens you plan to keep. Every chicken farm requires accommodation for its chickens. A simple chicken coop and small poultry cage may be all you require, unless you are planning to establish a commercial farm to raise chickens and/or produce eggs. Larger operations require multiple chicken or hen houses that are roofed and usually fully walled. In some countries, the Philippines for example, structures may have open sides so that the interior doesn’t get too hot and humid. Whatever the design of the chicken house or houses on the farm, good ventilation is essential. In cold climates heating may be required. 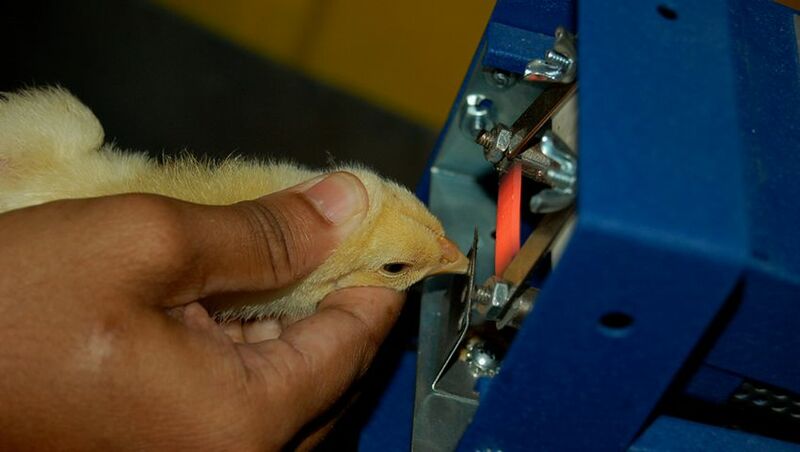 Commercial chicken farms generally have artificial lighting because this stimulates production of eggs. Hens kept for egg production require 12 to 17 hours of light each day; if they get any less they are likely to stop laying. Presuming the poultry farmer already has the building or buildings he plans to use to house his chickens, standard chicken cages can be chosen to meet the existing size of the structure. Alternatively they can be configured to meet the required design. Not all poultry cages are the same. So the first step is to choose a cage or cages that are manufactured to meet your needs. 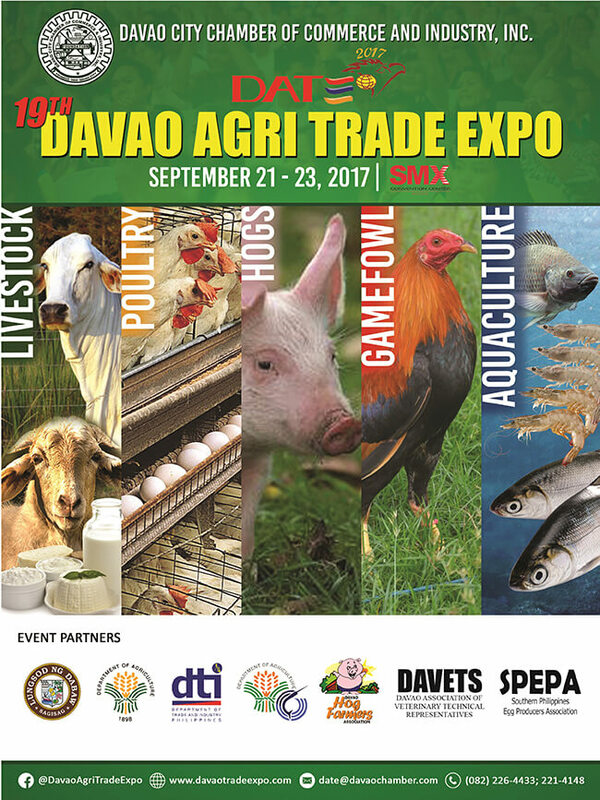 For instance, one chicken cage will be better for broilers, while another will be better for chickens that are kept for egg production. A completely different type and design of cage will be required for chicks, because they are smaller and the mesh used for adult cages will generally be too large. The quality of the metal used to manufacture the cages is also very important. The steel needs to be tough, strong and hard so that it can withstand any force that might otherwise cause it to break. It also needs to be ductile and malleable so that it isn’t damaged under stress and can be bent or hammered without breaking. Steel is manufactured worldwide to specific international standards that are developed by the Swiss-based International Organisation for Standardisation (ISO). ISO also has a strict quality management system, ISO 9001:2015, that ensures products meet legal requirements and regulations and maintain the quality expected of them. The carbon content of steel determines how hard the metal wire used for a poultry cage is, and how resistant it will be to corrosion. However, if there is too much carbon in the steel, it will become brittle. The carbon steel used for top quality chicken cages is chosen carefully. These are also galvanized with a thick zinc coating using a hot dipped process to ensure they won’t rust for at least a decade. Layer cage that feature big sliding doors, providing easy access to the chickens. The mesh at the bottom of these cages is designed to prevent chickens pecking at each other and also prevents chicken fatigue syndrome. The cages are very easy to install, and are supplied with all the accessories required, including a water tank, pipes and valves, and feeding troughs. Available with three or four tiers, they are suitable for chicken houses that are between 2.8 and 3 m high. Walkways between cages should be about 700 mm to 1.2 m wide. Ideally semi-automatic feeding machines should also be installed. Broiler cage that is designed to save space and provide a healthier environment than if the chickens were left on the ground. This design also prevents bacteria from forming and diseases from spreading. 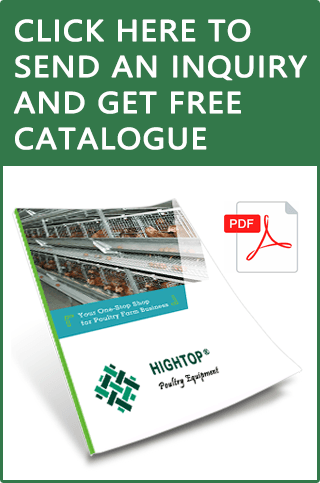 There are various sizes and configurations including popular broiler cages that comprise three tiers. Feeding machines help to make the farm operation more efficient, which ultimately improves profit margins for chicken farmers. Additionally, different broiler cage designs feature different methods of removing chicken droppings, specifically either a belt or a manure scraper. Like layer cages, broiler cages must be laid out with a good-sized walkway between them. Chick cage that is suitable for housing young chicks for about two to four weeks. 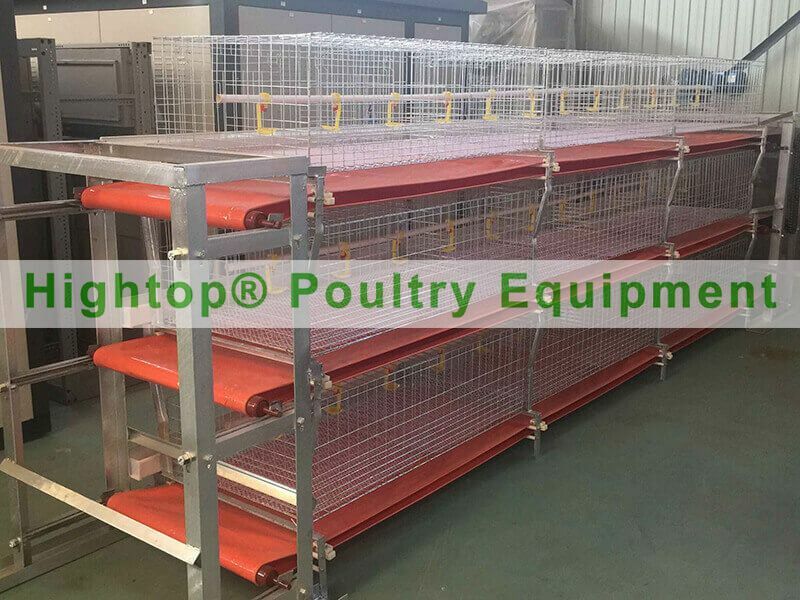 Available with three or four tiers, they vary in height from 1.2 to 1.65 m. These cages are made with a smaller mesh size to accommodate the smaller birds. 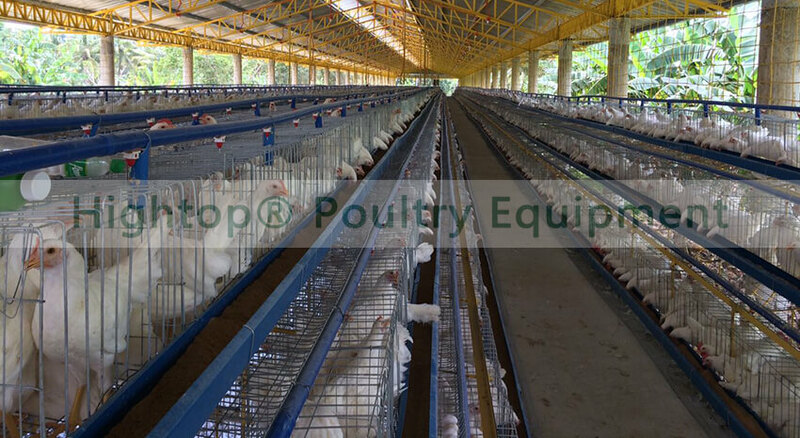 Hightop® Poultry Equipment complies with ISO standards and all chicken cages are made from top quality carbon steel and galvanized to prevent corrosion. The proven design of the company’s chicken cage range makes them popular with chicken farmers all over the world. 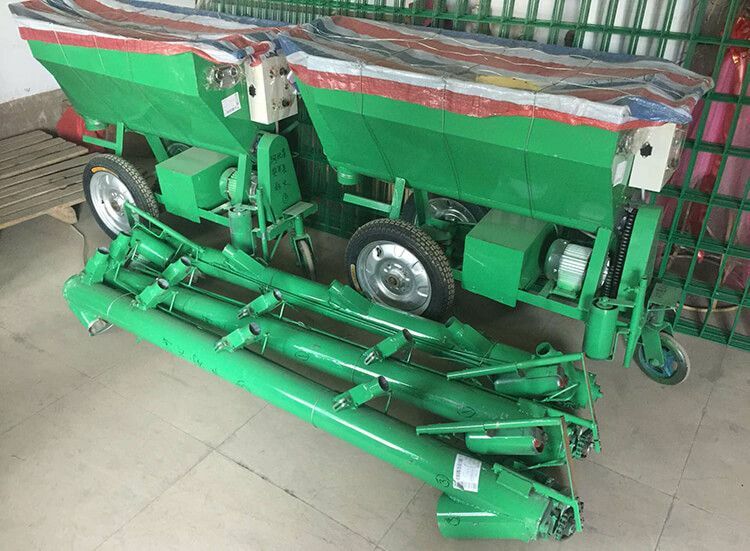 We also supply automatic and semi-automatic feeding systems, manure cleaning systems, and systems that automate collection of eggs. Contact us to find out how we can make your chicken-farming venture a success.